According to former Wisconsin Governor and Republican Presidential candidate Tommy Thompson, the U.S. Senate should hold hearings as required by the Constitution if President Barack Obama nominates a Supreme Court justice. MILWAUKEE - This morning on UpFront with Mike Gousha, Gov. Tommy Thompson called on Ron Johnson and Senate Republicans to hold hearings on an Obama nominee to the Supreme Court. 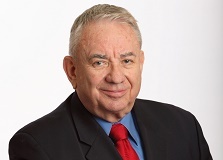 Republican Tommy Thompson, the former Wisconsin governor and U.S. health and human services secretary, says the GOP-led U.S. Senate should hold hearings if President Barack Obama makes a nomination to replace the late Antonin Scalia on the U.S. Supreme Court. Thompson made the comments on Sunday's edition of the public affairs TV program "Upfront with Mike Gousha." "I think the Senate has got to take on the responsibility and hold hearings. They can vote it down. But I think America is entitled to democracy to work," Thompson said. He added: "The government's got to work and it has not worked in years. And it's about time they start doing their responsibility. and carrying on what their repsonsibilty is, and that's holding public hearings. And then vote it down if they don't like the candidate. Let the next president choose. But to say, I'm just not going to hold publics hearings is not an answer." Republican senators including Wisconsin's Ron Johnson have vowed to block any nominee put forward by Obama.